Perfectly positioned in the heart of Australia’s most beautiful city, Space Q Capsule Hotel delivers convenient, cool and cost effective short-stay accommodation in an unbeatable Sydney location. 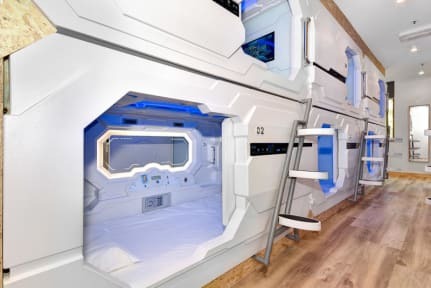 The capsule hotel concept allows guests to stay in a private, self-contained ‘pod’ complemented by modern shared spaces including a kitchen, living and entertainment area, male and female bathrooms and laundry. Boasting 100 ultra modern single and double bed capsules. Great location, right in front of the Paddy Market, we saved a lot of money shopping there then using the kitchen. The lounge area was cozy, the kitchen well equipped, the capsule very comfortable, we really enjoyed the privacy. I loved the quietness of the room! Most times when I stay at a hostel I can hear everything going on around, and I struggle to sleep through that. This place though, once I shut the door I could only hear sounds from my direct neighbors, and even those were quiet. I loved the feeling of privacy when I wanted it, but the ability to socialize that is the great part about staying in hostels. Good hostel if you want peace and quiet. No much going on in terms of atmosphere. Location is good, really close to Central station. 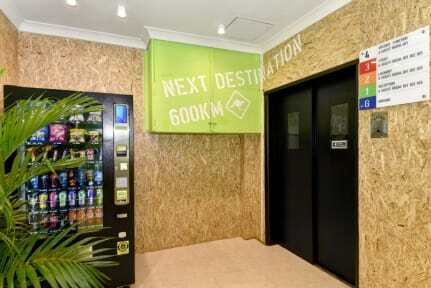 Huge lockers to store your valuables, plus you can leave your stuff on your beds since each capsule has a card key. Beds are comfy with loads of room in comparison to other hostels. Nice location and bedding is soft and comfortable (pillow could have been improved). Quite spacious actually without feeling claustrophobic (well, that's for me). Staff and receptionist a bit... ok... sometimes you need to explain further what you mean until they get it (without their quizzical look). Fine if you just need a bed, toilet and shower overnight. Not bad. Very good location (short walk to Central Station and a lot of cheap restaurants.) Pods are reasonably spacious and private. Elevator is broken so only entrance is via stairs. Problem comes that it’s possible to enter the building without having to pass reception, so not all that secure. Elevators have been broken for years and they do not plan to fix it. Capsules are small and are basically bunk beds with doors. The rooms that contain the Capsules do not lock and the hostel in general does not have good security. Anyone without a key card can enter the building and enter any of the floors and rooms. In fact, someone was staying in a capsule below us and the hostel said they were not booked and they would look into it. Bathrooms could be cleaner.